LEE COUNTY, Fla. -- We are less than three weeks away from Christmas and within that time frame, the U.S. 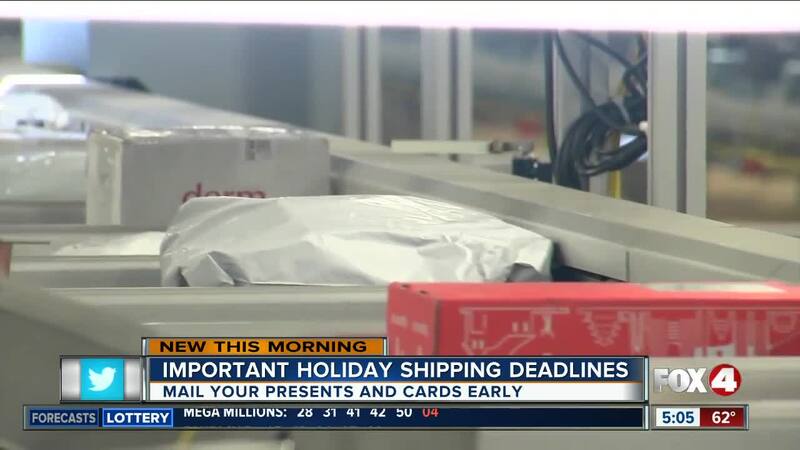 Postal Service expects to deliver billions of holiday cards and presents. To make sure every gift gets under the tree, with some help from Santa Claus and his elves, the postal service has important deadlines you need to know about. Since it’s their busiest time of year, the U.S. Postal Service has some of their offices open on Sunday. In Southwest Florida, the USPS Fort Myers spokesperson, Michael Vazquez said every post office will be open on Sunday Dec. 9th and 16th. The offices will be open from 12-4PM. 1) 1030 SW 8th Avenue in Cape Coral. It’s open until 630PM. 2) 2655 N Airport Rd. in Fort Myers. It’s open until 530PM. Vazquez said do not wait until the last minute to ship your gifts because the postal service is already busy. Since Thanksgiving and through New Year’s Day, the postal service expects to deliver more than 16 billion pieces of mail and packages. He said you should get to the post office 30 minutes before it opens to beat the long lines. There is a way to ship your presents without even leaving your home. You can go to USPS.com . Create an account with Click N Ship . You can print your shipping labels and buy postage online. Then, request your package to be picked up on usps.com/pickup . It’s free regardless of the number of packages. 1) Get a sturdy box reinforced with tape. 2) Bubble wrap your gift, especially if it’s fragile. 3) Take your time filling out the label. 4) Once it is shipped, track it on the USPS Informed Delivery App . For more information on all domestic and international mailing and shipping deadlines, can be found at the Postal Service Holiday Newsroom .